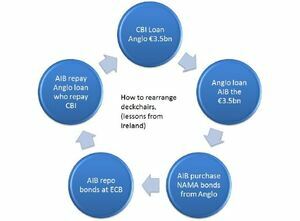 “Yesterday AIB acquired €12.2bn (nominal) of NAMA bonds from Anglo. The consideration for this was (i) AIB took Anglo’s deposit book of €8.6bn (ii) paid €200m for Anglo IOM and (iii) paid Anglo €3.5bn in cash. Now, the obvious question is: Where the hell did AIB get €3.5bn in cash for this deal? The Irish Gov launch an auction for the Anglo. Only people to turn up are AIB, who have no money. Anglo’s asset against the deposits is this NAMAbond which AIB want for repo [A repo is a form of short-term borrowing for dealers in government securities. The dealer sells the government securities to investors, usually on an overnight basis, and buys them back the following day]. Because AIB do not have the money to pay for the extra cost of the NAMAbond, they borrow the cash. From Anglo. Of course, Anglo don’t have the money to lend either, so they borrow it from the Irish Central Bank ELA. AIB now have the bond (which they purchased at exactly the price it repos at through the ECB) and repo that bond at the next opportunity (either tonight’s MLF [Marginal Lending Facility] or next Tuesday’s MRO [Interest rate on the main refinancing operations) and use the cash to pay back Anglo who then pay back the CBI. Posted in Misc, News on 5:00 pm by February 25, 2011 .